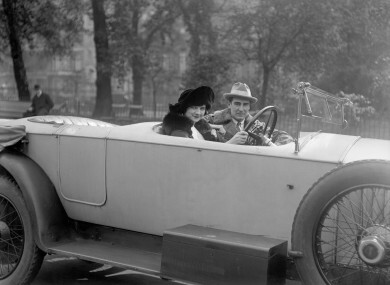 Film director Rex Ingram with his wife , actress Alice Terry, as they go for a drive through Hyde Park, London. IF YOU’RE NOT a student of film or a movie buff, chances are you haven’t heard of Rex Ingram. The Irish director was huge in early Hollywood – so big that he has his own star on the Hollywood Walk of Fame, and that he can count Martin Scorsese among his fans. Yet here in Ireland, he’s almost a forgotten name. But in honour of this year’s St Patrick’s Festival, his work is being brought to a new audience. The festival is set to screen his 1921 silent film The Four Horsemen of the Apocalypse at St Patrick’s Cathedral, with a live score written by Matthew Nolan and Barry Adamson. Rex Ingram was born Reginald Ingram Montgomery Hitchcock on Grosvenor Square, Rathmines, but due to having a clergyman for a father he spent years living in Kinitty, Co Offaly. At the age of 18, he moved to the USA. It was there that he began working in the film industry and made his mark in Hollywood. A till from The Four Horsemen of the Apocalypse. Trinity College Dublin lecturer Dr Ruth Barton has literally written the book on Ingram, called Rex Ingram: Visionary Director of the Silent Screen. The Four Horsemen of the Apocalypse was based on the Spanish novel of the same name by Vicente Blasco Ibáñez, and adapted for the screen by one of Hollywood’s first female screenwriters, June Mathis. The film starred Pomeroy Cannon, Josef Swickard, Bridgetta Clark, Rudolph Valentino, Wallace Beery, and Alice Terry. His other films included swashbucklers, and big historical epics. “And he was just ginormous – and yet somehow he’s gotten completely forgotten about,” said Barton. One of these reasons is because he worked during the silent era. But the second, and perhaps most important, is that his films are very hard to get hold of and to screen. When Barton was launching her book, she had to buy a laser disc copy of a film of his, and get a laser disc player so that it could be played. “If the films are not being screened, people don’t know about them,” she said. This meant they weren’t necessarily all fast-moving, but some of them “have kept the pace of time”, she said. Sometimes films pop up and it goes to prove that people will go see art films and you don’t have to be arty. They will go see Guillermo Del Toro’s film The Shape of Water, for example. That is part of Ingram’s visionary quality – that film was an artform. He left Ireland in 1911, and moved to Long Island in 1913. It was there that he saw the film A Tale of Two Cities, which made Ingram fall in love with cinema. He began working in a medial job with the Edison company, and even starred in a few films. “He started mucking around in the early cinema industry and he was there really at the very beginning of film,” said Barton. But when he eventually became a director himself, he fit well into the stereotypical mould. “He was a complete control freak and kept falling out with people. He wanted films to look exactly as he wanted them to be,” said Barton. The film that made his name was The Four Horsemen – and it also made Rudolph Valentino’s name. “This gave him his name and then he made a series of films – another one with Valentino and a few others. He was really discontented in Hollywood and it was beginning to become much more controlled in terms of what you could do,” said Barton. But as Hollywood moved into the era of the ‘talkies’, Ingram’s career suffered. “When sound came in 1928 he didn’t transition well to sound or to colour. He didn’t like it. He didn’t or couldn’t keep up with the changes in the film industry,” said Barton. But due to illness, he returned to Hollywood, where he died in his 50s. But unless you can see his films, it’s hard to stoke that interest. Rudolph Valentino and Alice Terry. There are plans afoot for a documentary on Ingram, said Barton, which would help to increase the interest in him. One of his biggest fans is Martin Scorsese, whose editor Thelma Schoonmaker’s former husband Michael Powell (of Powell and Pressburger) did his apprenticeship with Ingram in Nice. Karen Walshe, who’s artistic director of the St Patrick’s Festival, explained why they decided to bring this Rex Ingram film to a new audience. She said that Matthew Nolan, who co-created the score, was the brainchild behind the Ingram show, which was borne from his passion for silent film. “It was so difficult to get screening rights for the film,” she added. The cost was much more than it usually is for film screenings. Meanwhile, Nolan said that it was “quite the responsibility” to score the film. “Our ambition here is to create music and even a sound world that is more restrained, understated, yet consistently echoes the core themes of the movie as well as Ingram’s highly refined visual sensibility,” he said. What makes this particularly exciting is having someone of Barry Adamson’s calibre on board. His experience working with the likes of David Lynch, Oliver Stone, Derek Jarman as well as Nick Cave will bring something quite unique to the project. Special attention has also been given to the screening of the film, with the festival working with a company that supplies a special screen suitable for this type of film, which itself will be placed up high to avoid people not being able to see properly. “Everybody will see the film really clear, at perfect height and surround sound in the cathedral,” said Walshe. As part of the festival, the entire event will also be performed in Manchester the next day. The Four Horsemen of the Apocalypse (1921): Screening & Live Score Performance, directed by Rex Ingram with live musical accompaniment by Matthew Nolan, Barry Adamson (UK), Seán Mac Erlaine, Adrian Crowley, and Kevin Murphy: Thursday 15 March, tickets €24.00, at St Patrick’s Cathedral. Email “Rex Ingram: Ireland's forgotten Hollywood blockbuster film director ”. Feedback on “Rex Ingram: Ireland's forgotten Hollywood blockbuster film director ”.